produce a property line survey. 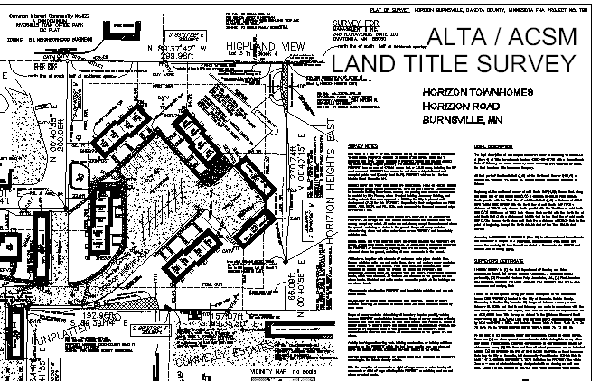 What is an ALTA / ACSM Land Title Survey or a property survey anyways? offers a professional opinion of where the property line lies, just as if where the line lies was ultimately decided in a court of law. of a boundary line, due to each surveyor evaluating evidence differently to arrive at different property line location opinions. versed in boundary law, and highly experienced should be considered to conduct a land survey of real property. 1. Does the property really exist? 1 Does the property really exist? decides if the description conforms within reason to the evidence of its location on the ground. location, or possibly by adverse possession. A quiet title action may be necessary to bar other claims to the property. property, or non-conformity with city ordinances regulating building setbacks. basis for a title insurance company to remove its survey exception regarding "any state of facts an accurate survey might show." line, not two equally ambiguous and false lines. This issue may evolve into litigation reviewed and decided by a court of law. to a land owner or attorney shows far greater information than property lines alone.